The Town of Wesson, Mississippi, was founded in 1864, during the Civil War, by Col. James Madison Wesson. Having lost his mills at Bankston, Mississippi, Col. Wesson relocated to the town that now bears his name. There he built the Mississippi Manufacturing company which produce a fine quality cotton fabric. 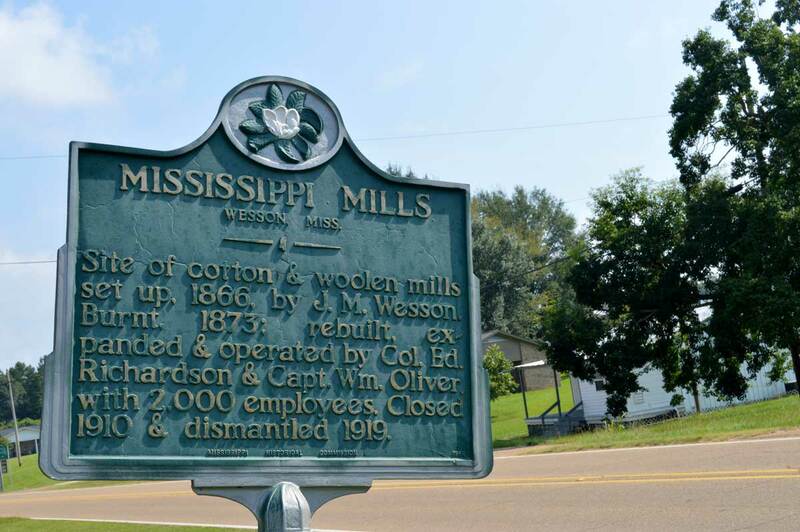 In 1871 he sold the mill to Captain William Oliver and Mr. John T. Hardy who renamed it the Mississippi Mills. The mills became famous for the quality of cotton fabric produced which was dubbed “Mississippi silk” at the centennial celebration of 1876. A product of the industrial revolution Wesson, Mississippi, and the mills located there, began to utilize the new technology of the rapidly changing age. One year after Thomas Edison perfected the light bulb the Mississippi Mills put them to use. It was said that passengers on the evening train would rush to the windows when passing through Wesson in order to see the marvelous lights. This prosperity, however, came to an end after the death of Captain Oliver in 1891. Financial difficulties followed by the economic “Panic of 1893”, family conflict, and labor disputes caused the mills to fall into receivership in the early 1900’s. finally they were dismantled and sold for scrap during the First World War. Wesson is a town with a glorious past, an outstanding present, and a promising future. In its transition from a milling town which produced the best material in the world, to an education town with a community college which ranks at the top scholastically, Wesson is unique. The first public school in Wesson was built in 1875, and the community college was added in 1928. Statistics show that the town is “on the move” with creativity, ingenuity, dedications that exists in the Copiah County town of Wesson. Copiah-Lincoln Community College provides academic courses equivalent to the first two years of college or university work that can apply to a baccalaureate or professional degree. Co-Lin also offers programs to prepare students for employment and community service. The college also offers programs for workers to update their skills or learn new ones.. The main campus is located in Wesson, Mississippi. Another campus is in Natchez, Mississippi, and a facility is in Magee, Mississippi. Copiah-Lincoln Agricultural High School, through the joint efforts of Copiah and Lincoln Counties, was established in the fall of 1915 at Wesson, Mississippi, in the edge of Copiah County. During its early years, the high school was a boarding school serving the rural districts of those counties. However, as consolidation of local schools progressed within the counties, practically every family in each county had access to an accredited high school. This availability of local schools created a new role for the agricultural school. In addition, educators in the agricultural high school and in the county public schools became aware that the youth of Copiah and Lincoln Counties needed educational opportunities beyond the level of the 12th grade. To meet this need, Copiah-Lincoln Community College was organized during the summer of 1928 under the authority of Section 308, Chapter 283, of the General Laws of the State of Mississippi of 1924. Although an enrollment of about 50 students was anticpated that first year, the actual enrollment was more than 90. 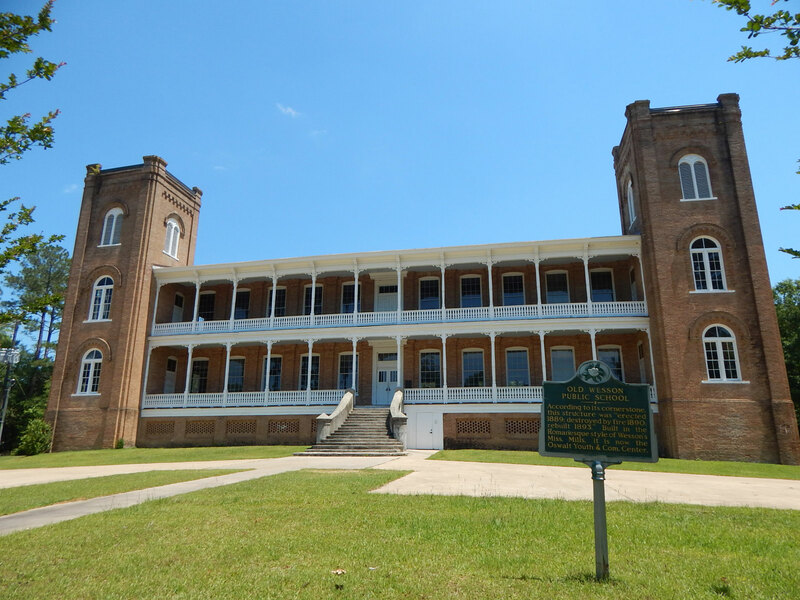 Since its establishment in 1928, Copiah-Lincoln has continued to grow in size and prestige and now occupies a prominent position in the state’s educational system with an enrollment of over 2,000 and a physical plant valued at more than $35 million. In the fall of 1978, the Copiah County superintendent of education assumed responsibility for the high school. It was renamed Wesson High School. During the fall of 1979, the Wesson High School was moved to a new facility in Wesson.